The Differences between the 2 webpage is that DIGI’s MI3 banner indicated the it will be available from the 27th May. 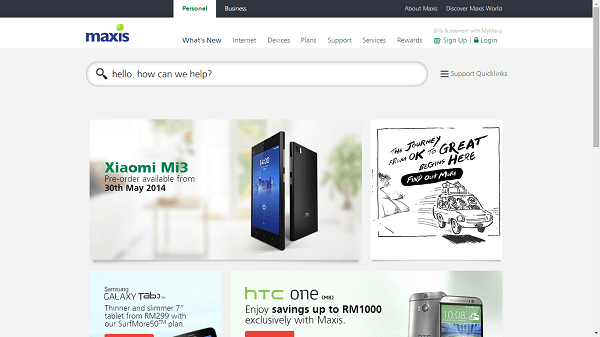 While Maxis’s banner indicated pre-order will be available from the 30th May. We are hearing rumours that Celcom too will be offering the Xiaomi mi3. It actually make us wonder why. The MI3 has been selling out online within minutes where ever in the world it open to. Selling to the telcos would lower the xiaomi’s margin. Xiaomi does not need the telcos actually. The telcos needs Xiaomi. As smartphone users are getting educated in volumes on how to judge the suitability of a phone based on it’s specs and not on it’s branding and Advertisement. Flagship phones of leading manufacturers has been reporting a slump in sales. Where else china phone which offer “value for specs” has been gaining ground. For more details on the Xiaomi Mi3 specs. Please click here.